"Art can only be monumental." Auguste Herbin, from a family of weaver, is born in Quiévy, small village near the Belgian border in 1882. The artist however regarded Le Cateau as his hometown since his parents are living there since 1883. He spend there all his youth, receiving his certificate of primary studies; he takes classes at the Municipal Drawing School, then at the School of Fine Arts in Lille in 1898. The young man moves to Paris in 1901. He begins painting in the impressionist manner, participates in exhibitions in Paris (first exhibition at the Salon of Independents in 1905). 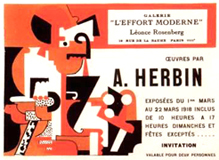 His encounter with Picasso, Braque and Juan Gris at Bateau-Lavoir (1909) brings him closer to Cubism; from 1910, at the Salon of Independents, Herbin exhibits in the same room as Fernand Léger, Albert Gleizes and Jean Metzinger. The artist participates in the important exhibition of the Golden Section two years later (1912). 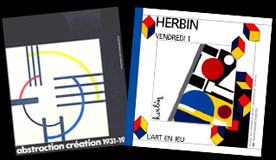 Auguste Herbin gives an angular geometry to his forms and realizes his first abstract paintings in 1917. 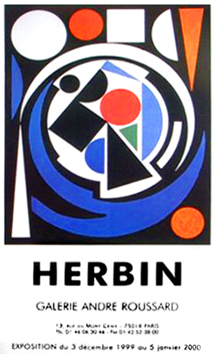 Herbin decides to abandon Cubism two years later since he considers Cubism out. Critics poorly receive his paintings on wood geometric in relief. 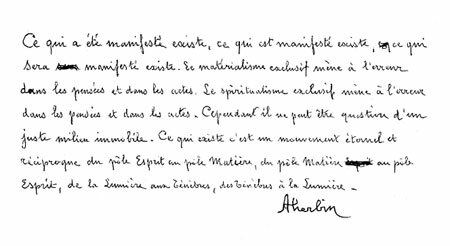 During the Great War, Herbin is assigned to the decoration of a military chapel at Camp de Mailly-le-Camp, and then to work in a stealth airplane factory (Many artists are affected in such services: Dunoyer de Segonzac, Andre Mare, etc.). 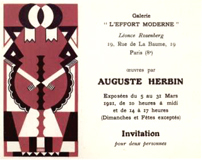 In doubt and following the advice of Leonce Rosenberg (art dealer, dealer, publisher and renowned collector), Herbin returns to a figurative style between 1922 and 1925, a period he later disavows. 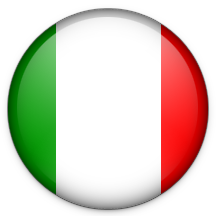 In 1927, he finally discovers the "pure" geometric abstraction of monumental trend, which is now his. 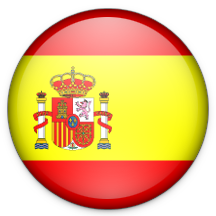 In 1929, Auguste Herbin becomes co-founder of " Surindependents Salon”. 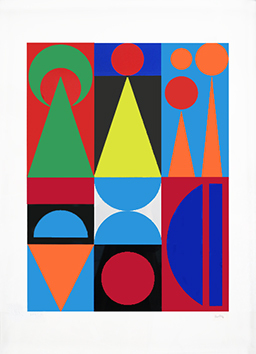 In 1931, along with George Vantongerloo, Herbin is behind the creation of the group Abstraction-Creation that results from the exhibition "Association 1940"; his painting, pure solid color becomes fully geometry formed by squares, circles and other figures. He spends these years in a painting entirely geometric made of simple shapes areas of pure color, alternating with undulating forms. 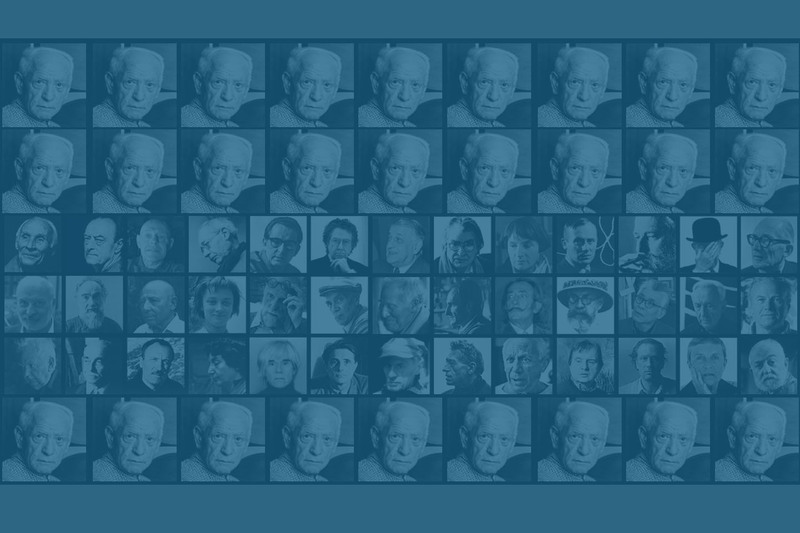 At the end of the Second World War, Auguste Herbin is the co-founder of the Salon of New Realities, then become vice-president and from 1955, president. 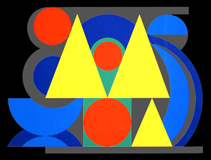 In 1946 Herbin develops his "plastic alphabet", an essay of coding connections between letters, colors and shapes. In 1949 he presents his book "The non-figurative art, non-objective" where he exhibits his plastic alphabet, the book becomes one of the major reference in abstract painting of that period. 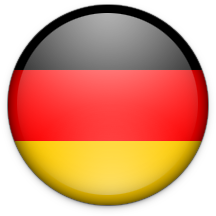 Herbin proffers there his theories of color inspired in part by the color theory of Goethe. 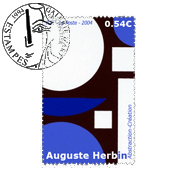 In 1953 Herbin is struck by paralysis. He learns to paint with his left hand. His works are exhibited in museums around the world. 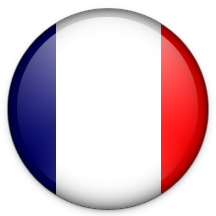 In 1960 at the age of 78 years, the artist dies in Paris. Following his sudden disappearance, a painting remains unfinished and is titled "Fin" (End).